Green anole lizards are small lizards that are popular as house pets. Their popularity is often linked to their ease of breeding. 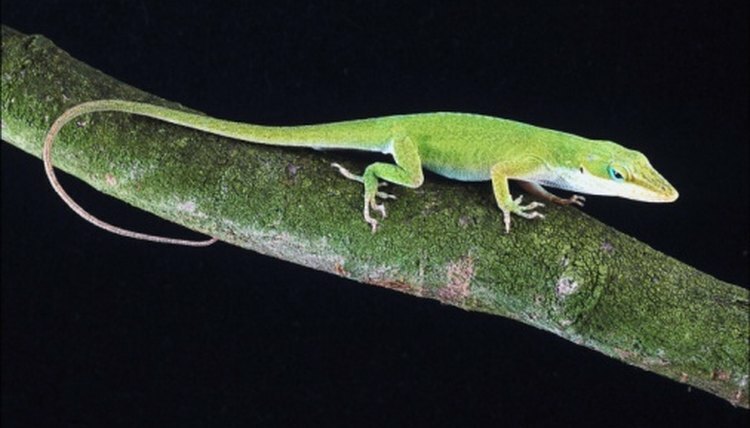 Pairs of anole lizards often breed and produce eggs. These often hatch if left in the cage with their parents. However, you can also make sure they meet the perfect conditions for hatching. Green anole lizard eggs must be maintained regularly and kept at a specific constant heat to develop and hatch properly. Fill the Tupperware tub half way with dirt. These jugs should be about 3 to 4 inches in diameter. The dirt should match the dirt you have placed in your lizard cage. You should have one tub per egg. Use your pencil to poke holes in each tub lid. These lids help simulate air flow to the eggs, which is vital in their health. The lid helps keep out insects or other predators who may eat the eggs. Scoop each egg up individually using your spoon. Be very careful to avoid breaking them. Place each egg in one tub and seal them with a lid. Place them in the cardboard box for easy storage. Install your heat lamp above your cardboard box. Make sure the box and lamp are placed in a safe area. Point the heat lamp down. Put your thermometer on the ground and wait a few minutes. Adjust the height of the heat lamp until the thermometer reads between 80 to 85 degrees Fahrenheit. This is the temperature range necessary for the eggs to hatch. Check the temperature every 12 hours to make sure it remains consistent. Place your UV lamp light above the box. The eggs need UV light for 12 hours a day. Turn it on and off during your temperature checks. Water the eggs with a water bottle in the morning and just before the end of the night. Spray only a fine mist over them to keep them wet. Continue monitoring your heat, UV light and water until your eggs hatch.